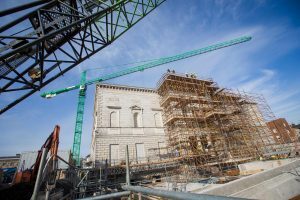 After suffering a contraction during the economic crisis, the Irish construction sector is now rebounding with a more optimistic future outlook. In a new report Construction in Ireland – Key Trends and Opportunities to 2019 growth of 5.8% is predicted over the next four years. In real terms, the industry’s output value recorded a compound annual growth rate (CAGR) of -2.5% during the review period (2010-2014). Factors, such as weak business confidence and consumer demand, high unemployment and a large budget deficit, lessened demand for construction during the past five years. Timetric predicts that over the forecast period the industry’s output is expected to grow at a CAGR of 5.8% in real terms, and to pick up from a total of US$15.7 billion in 2014 to reach US$20.8 billion in 2019. The growth will be supported by growing investment in social housing, new commercial and infrastructure projects; as well as improving consumer and investor confidence as regional and global economic conditions pick up. Residential construction was the largest segment in the Irish construction industry during the review period, accounting for nearly 40% of the industry’s total value in 2014, and the market is expected to follow a similar trend over the next four years. The country’s growing population and decreasing unemployment along with the government’s strategy to improve the supply of social housing will back the market. Commercial construction was the second largest segment, which due to stagnant levels of economic activity recorded negative growth rates during the review period. Over the next few years, growth is expected to return, driven by positive developments in domestic and regional economic conditions, investment in office and retail buildings, combined with an increase in disposable income and also by the prosperous tourism sector. In order to meet the demand generated from the process of urbanization, the country’s transport infrastructure system requires large investment. As a result, in its 2015 budget, the government increased its capital expenditure on infrastructure development by 6.3%, from EUR3.3 billion in 2014 to EUR3.5 billion in 2015 – investment that will support the infrastructure market over the forecast period. All information is based on a Timetric report: ‘Construction in Ireland – Key Trends and Opportunities to 2019’.